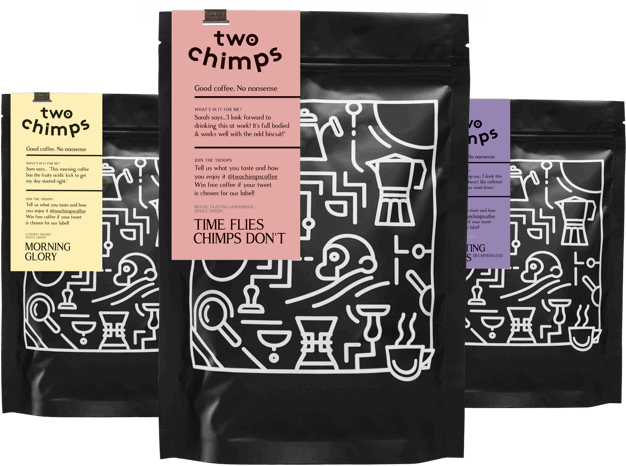 We all know it’s not possible to save the planet single-handedly, but here at Two Chimps Coffee we try to do as much as we possibly can to make a difference in this wonderful world of coffee. We wanted to share with you the little things that we do on a day to day basis to make a difference and reduce our carbon footprint as much as possible, so here goes! The only ‘waste’ that heads to landfill is that which we physically can’t re-use or recycle. Our coffee arrives in 60-70 kg hessian sacks which are often lined with a plastic grain pro sack too. When the coffee sack is empty, the grain pro bags are used as bin bags at the roastery. The hessian sacks are then given or sold as decorative items. You can make all sorts out of wonderful things with them; Cushions, seat covers, wall art and more. We also donate these to local shops to use as display items to promote the coffee they use along with giving them to art galleries to help wrap and carry sculptures. All of our used coffee grounds are put into compost or onto garden soil to help feed plants. The coffee grounds help to keep slugs away from your plants and also help plants like roses grow. Top Tip – if you brew with a filter and this is unbleached – you can throw this on the pile too! Check out our Great News for Green fingers blog post to find out more! Our roaster is as energy efficient as it could be. It uses convection and conduction heat, drawing air from the outside to help the roast. It is so efficient that the roaster is only lukewarm on the outside when we are roasting. ‘Chaff’ is the only bi-product of the roasting process. This ‘silver skin’ or parchment is a protective natural wrapping around the green coffee beans. When the beans get hot, this chaff flakes away and is blown from the roaster drum. This chaff collects in the bottom chamber of the roaster. Once cool, the chaff is removed and makes its way to a friend who has Chickens in her backyard. Apparently, coffee chaff makes great bedding for their chickens. Happy Chickens = Yummy Eggs! Our takeaway coffee cups are fully recyclable; even the stickers. At events, we provide bins for customers to dispose of our cups. These cups are then sent to ‘Simply Cups’ to be fully recycled. So there we have it, our carbon footprint is ‘chimp’ size. Have ideas on how we can make our footprint even smaller? Get in touch with the team!